Ummm yeah, we are getting dang close to this boy's due date! Not pictured...gold Sperrys...yes I wore Sperrys to church. Necklace: Not sure...it was a gift. Probably Forever 21? How Far Along: 39 weeks, 2 days. 3rd trimester! As of today there are 5 days until the due date! The due date is THIS Monday the 27th!!! Size of the Baby: Watermelon, 6-9 lbs, 19-22 inches long! Maternity Clothes: They are pretty awesome. And good news: I did wear my maternity swimsuit like I was hoping from last week...3 times! Weight gain/loss: 31 lbs. I didn't gain or lose a pound since my 38 week appointment. I just maintained. Sleep: It has been alright. I'm sore a lot of places (hips, si joints, back) but I'm able to sleep for the most part minus the pee breaks every couple of hours (annoying)! 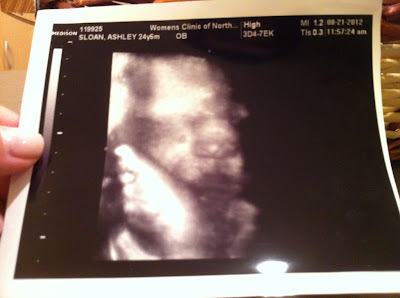 Best Moment of the Week: When I got to see our son in another ultrasound :) More on this below. Movement: Oh yes. He moves all.the.time. and is hurting me sometimes lol. But he has no where else to go so it is fine even though a bit painful. Symptoms: Just aches/pains but really that is it. I feel pretty well for being 39 weeks I think? I don't know what really is normal but I feel lucky. Food Cravings: Again, I don't know if I have any. We just ate a bunch of fruit on waffles for dinner (with cool whip of course) which was good and had yummy German food last night! Belly Button in or out: Sooo Kevin let me know that it has officially popped but I have mixed feelings. Yes it is coming out but it still goes in lol. Take it or leave it! Anything making you queasy or sick: Nope, although I had heartburn last night which was annoying. Labor Signs: Nope, like not at all! I guess he has technically dropped if you call that a labor sign. But no contractions that I am aware of. Wedding ring on or off: Off. I just wear random rings on my ring finger. What I miss: Wearing my wedding band/ring, working out for real, and having less aches and pains but obviously it is so worth it. What I am looking forward to: Meeting our man...that is what I think about a lot of my time now so I've got to keep busy!!! Nursery: Good enough! We got all the essentials. I hope to decorate the walls sometime or do some DIY projects...but we got awesome furniture and the basics. It looks pretty good though. Emotions: Pretty good just getting a little antsy as we await his arrival. * August 21, 2012 - I went in to the Women's Clinic to get my amniotic fluids checked because there was a chance there was a small leak. Oh, and my mom came to this appointment with me! They did a test and I wasn't leaking fluids which is great and they wanted to double check with an ultrasound which was awesome! The last time we had an ultrasound was at 22 weeks so it was great to see him again! 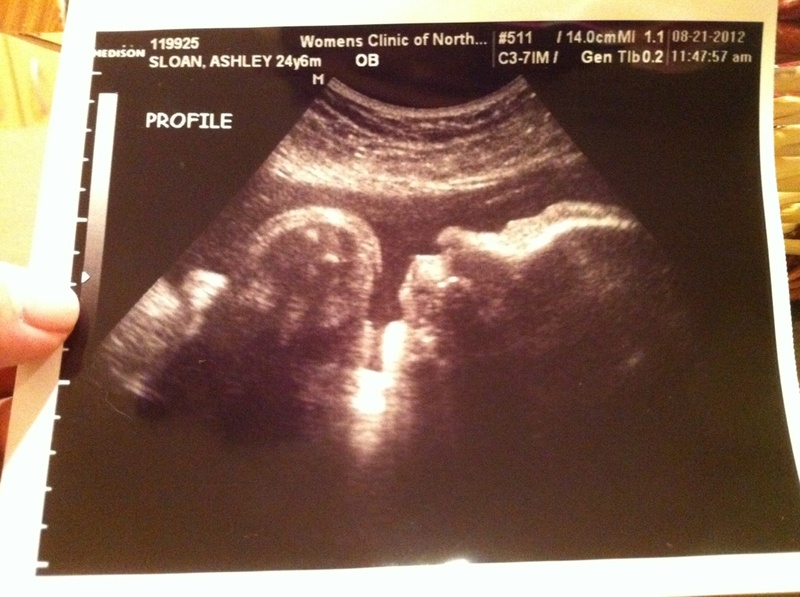 It was crazy because we got to see him drinking amniotic fluids and moving his mouth. All of us were laughing so hard because it was hilarious. He kept moving his mouth and swallowing fluids and I think we saw his tongue. 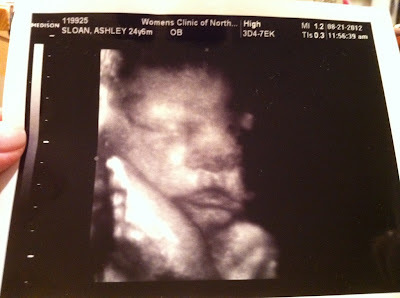 The ultrasound tech then asked if we wanted to get a few pictures in 3-D which of course we said yes! From the ultrasound, the fluids were at 16 (not sure what they measure the fluids in) when the average is between 10-20 so we are good to go. It was a really good thing there was no leak because if there was it could have been bad...if I even suspect a leak or right when my water breaks (if it doesn't before I get to the hospital) I have to call in/come in ASAP because of having Group B Strep. If you have it and don't come in the baby can get the infection, etc. That is partly why I came in - better safe than sorry. I was going to try and move my 39 week appointment a day earlier and have them check that at the same time but they had me come in right away (I had a 30 minute notice) and kept my appointment for today. It was good to know everything was going well and he was healthy :) His heartbeat was 140 beats/minute. Here is our son at 39 weeks, 1 day. PS. On his lip is a shadow...it is normal fyi haha. Seeing him again made me feel like I could wait another week being pregnant because that is what I'm mentally preparing myself for haha. 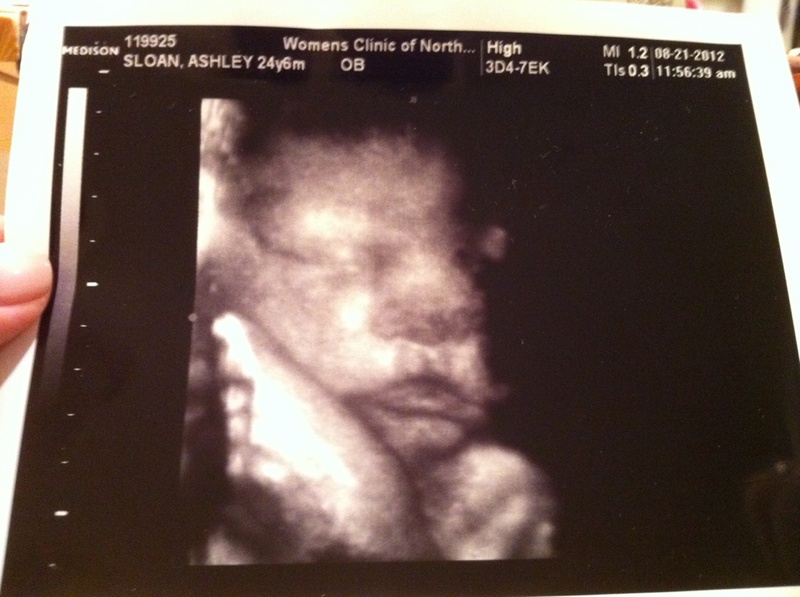 Of course, I'd like him out...now but he seemed so content in there just swallowing amniotic fluid! I guess he is just super comfy. Whenever you are ready babe, we are!!! * August 22, 2012 - We had my 39 week appointment today and it also went well. His heartbeat was 122 beats/minute which actually is a bit lower than normal for him but when they are sleeping or just chilling it is lower than if they are moving around a ton. I didn't gain any weight from last week so the total is still 31 lbs. gained. I haven't progressed with dilation or effacement so I am the same (1 finger/1 cm dilated and 50% effaced.) We talked about what will happen if I go past my due date (which is Monday). My 40 week appointment is next Thursday, August 30th (obviously if I haven't had him yet.) We will then look into doing a non-stress test and another ultrasound to check the amniotic fluids. After that, then a possible induction will be necessary. I sure hope he just comes on his own haha. We shall see!! !